Type in a search about Chinese food and you will likely find numerous references to rice or noodles. Both are referred to as the main staple in the Chinese diet, but if you travel much in the mainland you will notice that it really depends on where you are traveling as to what will be served. 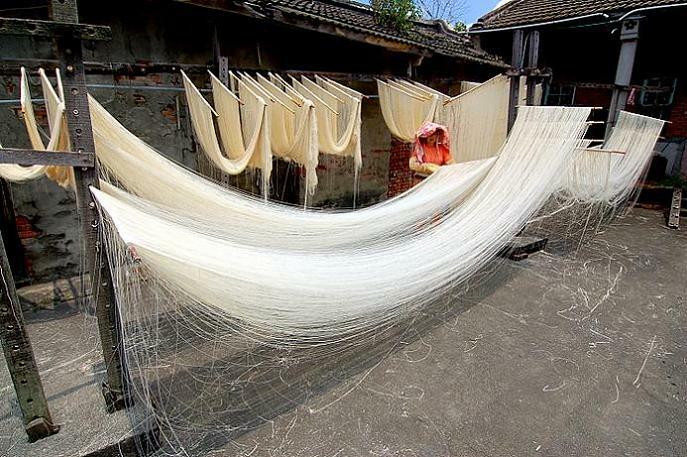 In the northern provinces of China you will find the noodles to be more prevalent. In fact many historians attribute the Italian pasta to Marco Polo and his travels in Northern China and Mongolia. If you travel in southern China you are more likely to find rice as the staple of every meal, the underlying reason for this difference rest in climate and agriculture. Rice has been found in archeological digs dating back 4000 years in Zhejiang Province, with evidence of the beginnings of the method of transplanting rice from the flooded beds to the rice plots found in the Yellow River Valley and the Hanshui Basin. Because of the water needs of rice, it was not grown in the northern provinces which tend to be dryer and colder. In the latter, they were known more for their wheat production. The result of the wheat production was the long noodle that is made from wheat. Although the noodles in Northern China are noted for being long, signifying longevity, they also come in different varieties: some noodle dishes are made with a shorter and squarer noodle. The two main noodle dishes that are known in America are lo mein 撈麵meaning ‘tossed noodle’ and chow mein 炒麵 meaning ‘fried noodle’. The ‘pulled’ noodle or la mian 拉麵 is known by the ‘hand-pulled’ method used to make it. At Yu’s Garden Chinese Restaurant we serve both rice and noodles, so come in today and enjoy your rice or noodle dish. Call 630.439.1635 or come by our website to order take out if you are in a hurry. Otherwise, come by our 404 Roosevelt Road location in Glen Ellyn and enjoy your meal while you visit with us. This entry was posted in Chinese Dishes and tagged 60137, Beijing, Beijing Chinese Restaurant, Chicago, Chinese food, Chinese Noodles, Chinese Restaurant, Glen Ellyn, Good food, healthy food, Illinois, Restaurant, rice, Yu's Garden Chinese Restaurant. Bookmark the permalink.